On Wednesday, June 26, several Arabic websites, including Veto Gate, quoted the intelligence report, which apparently was first leaked to the Kuwaiti paper, Al Ra’i. Prepared by Mahmoud Ibrahim Sharif, Director of National Security for Libya, the report is addressed to the nation’s Minister of Interior. It should be noted that these findings are unsurprising: the supremacism of prominent Brotherhood figure Safwat Hegazi is such that he publicly declares the Brotherhood “will rule the world“; Saudi Mansour’s hate-mongering, pro-Brotherhood TV station repeatedly aired footage of the YouTube Muhammad movie inciting violence around the Muslim world; popular Sheikh Muhammad Hassan holds that smiling to non-Muslims is forbidden, except when trying to win them over to Islam; and Sheikh Hazim Abu Ismail is simply an openly anti-freedom, anti-infidel religious leader. 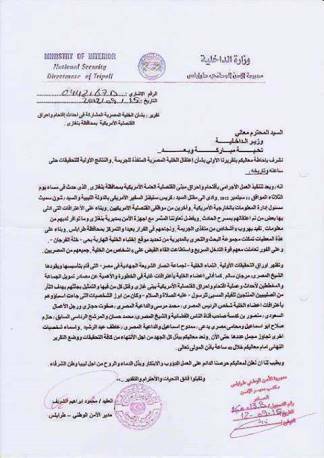 Update: On July 11, Tahrir News further validated the veracity of this document. Filed Under: From The Arab World, Islam Tagged With: Libya, Morsi, Muslim Brotherhood, terrorism, U.S.